Verizon’s Mysterious $99 iPhone 5 Deal – Who Qualifies? Verizon has been coming up with some interesting deals lately. Last week they put the Galaxy Note II on sale for $79. This week, a new deal surfaced for online shoppers: a brand new iPhone 5 for just $99. 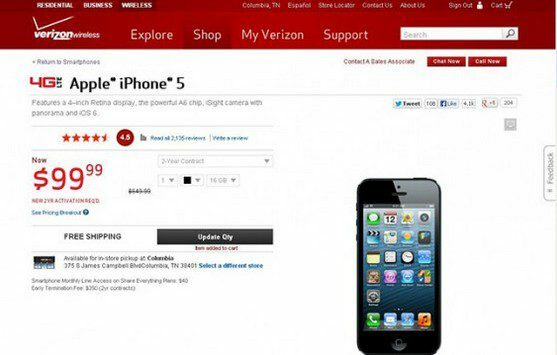 On Wednesday, the Verizon website highlighted the iPhone 5 with the 50% discount. The offer was not up for long though. It was quickly taken down, leading to a lot of speculation. While some thought this was just a mistake and there is no way that the iPhone 5 would cost less than $199, Verizon did confirm that they have a $99.99 iPhone 5 deal. However, it was mentioned that this offer is not available to everyone. There was nothing said about eligibility criteria for interested shoppers. However, it is rumored that the deal is aimed at new Verizon customers that are first-time smartphone shoppers. The iPhone 5 was reported as being chosen because of the belief that it is a much simpler smartphone to get used to if the customer has never used such a phone in the past. But it’s a bit of a mystery as to just what’s going on. There’s been some speculation that the deal may foreshadow the appearance of the iPhone 5S. Interested shoppers are left wondering if they qualify for the $99 iPhone 5 deal.